Last week I received an email from Laura of Sayonara Japan. She sent me a copy of her new e-book, The Stress-Free Guide to Leaving Japan, and asked if I wouldn't mind writing up a review if I got a chance. Well Laura, you got it. First off, let me just say that this is not a sponsored post. I did receive a free copy of this e-book, but I am not receiving any money or other form of remuneration for writing this review, nor am I affiliated with the authors or publisher. Let's jump right into it. The main appeal of the Stress-Free Guide is that it lays out what you should be doing and when, complete with detailed instructions and resources for most tasks. It's divided into three main parts, each addressing the tasks that you should be focusing on at the three-month, one-month, and one-week-until-you-leave marks. I, for example, being at the one-month mark now should be focusing on preparing to close my bank account and cancel my internet, getting my paperwork together for claiming my pension refund, etc. The book is nicely laid out and very easy to read. There are a number of mini checklists for your ticking pleasure and a generous amount of tables and charts with relevant information. Useful Japanese vocabulary are also provided in both romaji and kanji. 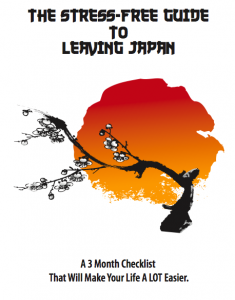 Would I recommend this book to someone preparing to leave Japan? I answer that question with a somewhat conditional "yes." I've been working in Japan as a member of the JET Program, with a whole support system in place to help me get by here. Since I have been here for three years now, several of my friends have already left and I have the benefit of their experience. I've also done a fair amount of research. And as an ALT, I don't have to worry about things like cleaning out my apartment as my successor will just move in after I leave. So honestly for me this guide didn't really provide much information that I didn't already have. That being said, I think it's probably a worthwhile investment if you (a) are on your own and don't have much support in leaving, (b) don't speak much Japanese and/or aren't very familiar with the process of leaving this country, or (c) aren't very organized or aren't very good at researching and budgeting your time. One thing the guide has going for it is content that addresses a variety of situations. Do you have a car or a pet over here? I don't, but I'm sure the relevant advice could be helpful for someone. I suppose it really comes down to how valuable your time is to you. Most of the guide's content can probably be found on the internet, but not in one place. Personally I kind of like doing research on the internet, but if you'd rather be doing better things with your time, the hours and possibly the anxiety that the Stress-Free Guide could save you may be worth the 500 yen cost.